Sensei Eugene is an opponent of great respect as he himself has years of experience and understanding how to train kumite and be a winner. He was SAJKA Men’s Open Kumite champ multiple times. Melanie Marchbank CA (SA) and a Godan, has a host of achievements in karate, her most recent has been in October 2014 at the Funakoshi Gichin Cup 13th Karate World Championship Tournament in Tokyo Japan; where she fought in the final eight female individual kumite section. 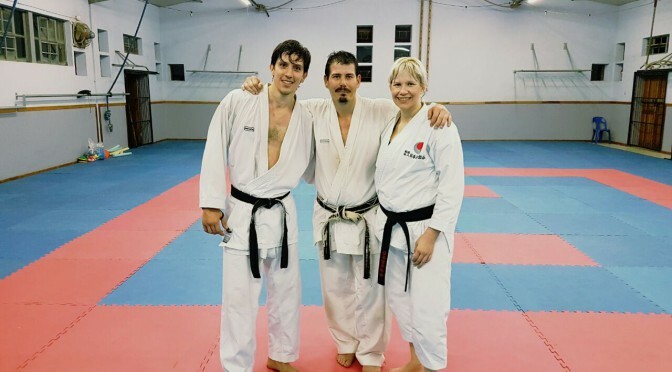 Lorenzo Helena CA (SA) and a Yondan, also competed at the Funakoshi Gichin Cup 13th Karate World Championship Tournament in Tokyo Japan; where he competed in the top16 in the Men’s Kata division. After a hard kumite class we wish both of them good luck to reach and achieve all their karate dreams for 2017. SO is looking forward to train with them again.